Today I am linking up again with the DC Trifecta Friday Five. Thanks to EatPrayRunDC, YouSignedUpForWhat? & MarontheRun for hosting this link-up. When I saw this topic, it made me smile. But as I started thinking about it, I realized I don't really have many. But decided I wanted to join in on the link up regardless. So I admit ahead of time, my list is a little on the boring side. 1. I only wake up 2 hours before I have to be at a race start line (unless it's a big one that I have to take a bus or something.) I flip the T.V. on and it takes me a good 20 minutes to get the energy to climb out of bed. I usually hit the snooze on the alarm a few times too. 3. I eat a bagel with cream cheese. I will have a bottle of water that I sip on gradually as I get ready. About half the time I may also eat a banana. I am really picky about what I eat before the race, I am a pretty simple girl, you won't find me throwing down pancakes or putting anything too heavy into my stomach ever. If in the rare instance I can't get a bagel and cream cheese, I will substitute a muffin. But nothing else! 4. I always Vaseline up the piggies, really good:) I rarely if ever get blisters because of this. I also put a bunch anywhere I am prone to getting hot spots/chaffing. This is probably the most important thing for me! 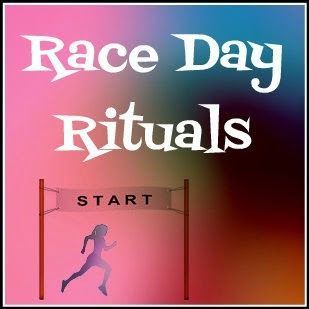 Yup, that's it I am super boring, but that is exactly what I do each race day morning!